NASA’s Curiosity rover looks back to ramp with 4th drill site target at ‘Bonanza King’ rock outcrop in ‘Hidden Valley’ in this photo mosaic view captured on Aug. 6, 2014, Sol 711. Inset shows results of brushing on Aug. 17, Sol 722, that revealed gray patch beneath red dust. Note the rover’s partial selfie, valley walls, deep wheel tracks in the sand dunes and distant rim of Gale crater beyond the ramp. Navcam camera raw images stitched and colorized. Eagerly eyeing her next drill site on Mars, NASA’s Curiosity rover laid the groundwork by brushing the chosen rock target called ‘Bonanza King’ on Wednesday, Aug. 17, Sol 722, with the Dust Removal Tool (DRT) and collecting high resolution imagery with the Mast Camera (Mastcam) to confirm the success of the operation. By brushing aside the reddish, more-oxidized dust scientists and engineers leading the mission observed a gray patch of less-oxidized rock material beneath that they anticipated seeing while evaluating the utility of ‘Bonanza King’ as the rover’s fourth candidate for Red Planet rock drilling and sampling. To date, the 1-ton robot has drilled into three target rocks to collect sample powder for analysis by the rover’s onboard pair of the chemistry labs, SAM and CheMin, to analyze for the chemical ingredients that could support Martian microbes, if they ever existed. So far everything is proceeding quite well. The brushing activity also revealed thin, white, cross-cutting veins which is a further indication that liquid water flowed here in the distant past. Water is a prerequisite for life as we know it. “They might be sulfate salts or another type of mineral that precipitated out of solution and filled fractures in the rock. These thin veins might be related to wider light-toned veins and features in the surrounding rock,” NASA said in a statement. Based on these results and more from laser zapping with Curiosity’s Chemistry and Camera (ChemCam) instrument on Sol 719 (Aug. 14, 2014) the team decided to proceed ahead. The imminent next step is to bore a shallow test hole into the brushed area which measures about about 2.5 inches (6 centimeters) across. If all goes well with the “mini-drill” operation, the team will proceed quickly with full depth drilling to core a sample from the interior of the dinner plate sized rock slab for delivery to Curiosity’s two chemistry labs. Bonanza King sits in a bright outcrop on the low ramp at the northeastern end of a spot leading in and out of an area called “Hidden Valley” which lies between Curiosity’s August 2012 landing site in Gale Crater and her ultimate destinations on Mount Sharp which dominates the center of the crater. As Curiosity drills, the rover team is also searching for an alternate safe path forward to the sedimentary layers of Mount Sharp. To date, Curiosity’s odometer totals over 5.5 miles (9.0 kilometers) since landing inside Gale Crater on Mars in August 2012. She has taken over 178,000 images. 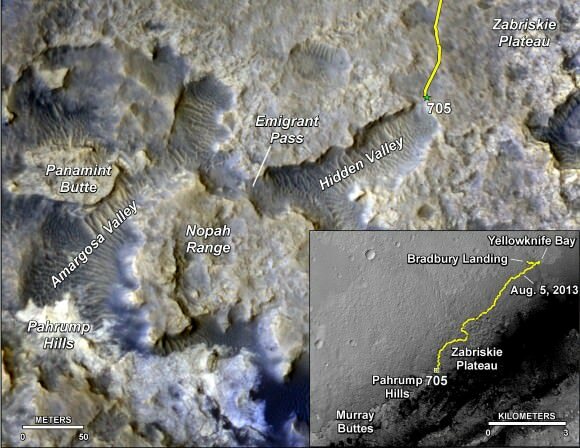 “Getting to Mount Sharp is the next big step for Curiosity and we expect that in the Fall of this year,” Dr. Jim Green, NASA’s Director of Planetary Sciences at NASA Headquarters, Washington, DC, told me in an interview making the 2nd anniversary on Aug. 6.